These are amazing small bites! Try serving them during the holidays or give as house gifts. Boil cream in a small pan until reduced to 2 Tbsp. Remove from heat. Stir in liqueur and chocolate, then return to low heat until chocolate melts (double boiler works well). Whisk in the butter, stir until smooth. Pour into shallow bowl and chill 40 minutes. 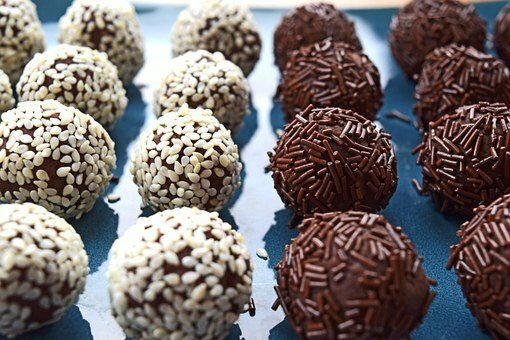 Scoop chocolate up and shape into 1” balls. Keep hands and chocolate cool or it will melt. Roll in sweetened cocoa or chocolate sprinkles.